Crime Watch: Ian Rankin to open Dunedin's 2012 Scottish Festival! 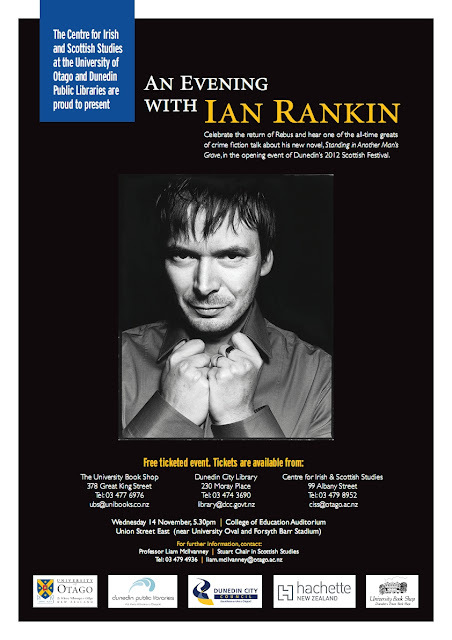 Ian Rankin to open Dunedin's 2012 Scottish Festival! In some terrific news for New Zealand-based crime fiction fans, legendary British crime writer Ian Rankin, who is bringing back his iconic investigator John Rebus after a five-year retirement in this year's STANDING IN ANOTHER MAN'S GRAVE, will be visiting New Zealand in mid November. Along with events in Auckland and Wellington (I will share specific details once those events have been confirmed), Rankin will also be opening Dunedin's 2012 Scottish Festival. Appropriate really, that one of the biggest names in contemporary Scottish writing will open the festival in New Zealand's 'Scottish City'. A free ticketed event too - so no excuses Southerners. Make sure you grab a ticket and head along!